This is Part 3 of the series. Part 1 and 2. “MAZINGER Z“, the first and the most influential Robot/Mecha Anime was aired in 1972. It was the time of consumerism, aftermath of turbulent sixties, the entrance to the highway of economic boom, Japanese technology revolution. In MAZINGER Z, the question of “perfect” only applied to the perfectness of the machines. The viewers of the program were kids born in sixties, the generation too far removed from the days of the Imperial military. The archenemies in MAZINGER Z are the worst kind of worst ex-Nazis, who are grotesque, sadistic and horrifyingly evil. It didn’t occur to the young viewers (including me) that Nazis were the partners to our grandfathers military. The series was one of the first to exploit the power of franchise business model through the medium of TV. All we kids cared about was this new, cool toy figures of Mazinger Z, made of “Super Alloy Z”, whatever that was. This 60cm tall toy, armored with the “Rocket Punch”, became a standard Christmas or birthday gift for the pre-teen boys, and was the perfect product of imagination which came true. Another popular TV program of the era was ULTRAMAN, and its special effects by Eiji Tsuburaya influenced many visual artists in later years. Kids loved it. Ultraman, a super-sized hero from the outer space, always defeat various sinister monsters terrorizing the Earth. These monsters frequently lands on Tokyo, smashing the buildings, factories, railways, bridges and the Tokyo tower. The realistic scalemodels of the city (which would certainly be demolished during the final 10 minutes of the program), extremely well-designed weapons such as aircraft, underground tanks, submarines and automobiles all contributed to the program’s immense popularity. It was the brainchild of Tsuburaya and his production company, which specialized in miniature scalemodels and costumes for movies and TV programs. His craft had evolved from the days of propaganda films during the war: miniature planes and ships gave authentic look to HAWAII MALAYSIA SEA BATTLE, but it went further after the war. GODZILLA had been the landmark special effects by the Tsuburaya production, and ULTRAMAN was expected to provide more both in quality and in quantity. With ULTRAMAN and its sequels, Tsuburaya did deliver the finest special effects of the era without resorting to heavy post-production. Moreover, the original ULTRAMAN sometimes had insightful bite on civilization, human behavior and society. Many of the monsters are actually the side products of human civilization, such as nuclear explosions (Ragon), nuclear radiation (Greenmons), pollution (Gesura), or social problems such as discrimination (Woo). It is well known that Eiji Tsuburaya was particularly fond of KING KONG, the classic monster movie. As you know, in this movie, the monster is brought to right in the middle of the civilization from the unknown island, only to terrorize the modern city of all the modern cities- New York. We are fascinated by King Kong, which climbs up the Empire State Building with Fay Wray in his hand. The image of a big hairy ape clinging on to the Building, fighting with airplanes is one of the most iconic in cinema history. It hits our primitive core about being human, deeply hidden in the myriad of webs of fear, fascination, owe and lust: beauty of human achievement on the verge of destruction by the hands of alternative version of ourselves. 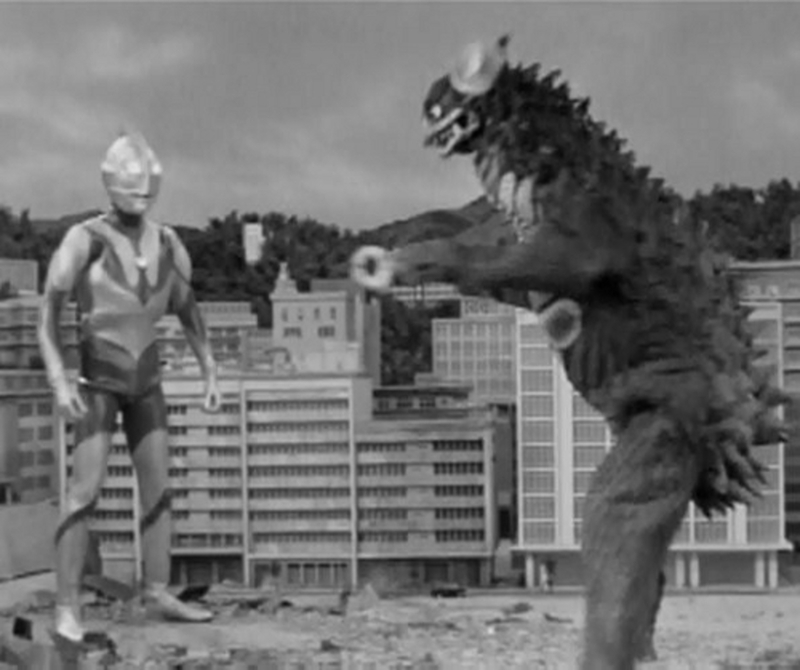 Tsuburaya’s vision was certainly direct descendant of KING KONG. Super-sized monsters, which do not understand OUR logic, having no appreciation for OUR civilization, destroy OUR achievements. Ultraman bursts into existence from nowhere to stop this barbaric activity. However, the stories sometimes challenged unwarranted rules of game we were playing. Is OUR logic right? Is OUR civilization heading for the right direction? The problem was, the iconic images of monsters and Ultraman in realistic scalemodel background were so impressive and fascinating that we, the boys of pre-teens, paid more attention to details of miniature buildings and railways than stories themselves. Then, as the series progressed, while reusing the same old plot elements over and over, it lost its bite and monsters became nothing but enemies to be crashed. Some of the monsters were destroyed simply because they were “nuisance to Japan’s economic growth”. The exhibition “TOKUSATSU – Special Effects Exhibition (2012)” was directed by Hideaki Anno. Tsuburaya Productions was one of the special contributors. The tagline for the Exhibition is “The origin of EVANGELION was the Great Warriors (from Nausicaä) and ULTRAMAN”. I don’t know how much of this is true, the exhibition being timed just before the new EVANGELION movie release, but I have to admit there is a strong resemblance between EVANGELION and ULTRAMAN. Considering that many of ULTRAMAN’s monsters were awaken from hibernation in underground by human expeditions, it is not far-fetched to see ‘Angels’ in EVANGELION are counterparts of monsters in ULTRAMAN. They both terrorize the civilization and, in many cases, destroy large part of it for no obvious reasons. For both ULTRAMAN and EVANGELION, the super-sized hero is expected to defeat these unwanted super-sized terrors in each episode. As I watched ULTRAMAN when I was a kid, and as I watched EVANGELION, and whenever an urban landscape appears as a backdrop for the fight, I felt slight buzzing noise in my head. Is it a ghost city? What do these empty streets mean? Is that building completely evacuated? Where did everybody go? These are trivial, silly questions. You would say, hey, it’s just a story. It’s just a meaningless bit of rules for the fiction. And I told myself so. Until I saw the photographs of evacuated areas of Fukushima. Empty streets. Empty buildings. Houses with trace of human activities left behind. Abandoned cars. Shuttered stores and restaurants. Blinking traffic signals. There is a huge, powerful, relentless monster roaming around the place. It is called radioactivity. And there is no one, no super-sized hero to stop it. I think, NEON GENESIS EVANGELION is a typical example, but, we tend to dislike people we don’t know – so we do not want to describe them in the story. Such tendencies are very prevalent within us. But if we make a movie with such feelings, though they are the feelings of our time and of our world, that will be a piece of garbage. If we don’t explore people who is unfashionable, the stuffs which are so dull, then ask what we are all about, it won’t be any good. EVANGELION, especially NEON GENESIS EVANGELION, the original TV series, has been identified as a quite unique pivotal moment in recent Japanese cultural history. One of the most discussed uniqueness of NGE is its stark contrast between apocalyptic vision of the world and minimalistic personal spheres of its protagonists. Shinji, the most promising pilot to operate Eva, is suffering from borderline Asperger syndrome, or severe case of adolescent fragility. But he is the one who could save the world (or at least Tokyo-3) from relentless attacks of Angels. As the series progressed, the story – or traditional plot elements necessary to understand the apocalypse – disintegrated and transformed itself into this soul search of Shinji’s and to some extent, of other characters. There are some explanations for this shift, from financial issues surrounding GAINAX, the production company, to Anno’s socio-philosophical stance on Anime. But in the end, the final product was quite a sensation. Then, there were a series of anime, literature, or games, which were influenced by NGE or descended from NGE. SAIKANO (She, the Ultimate Weapon), VOICES OF A DISTANT STAR and IRIYA’S SKY all shared the similar atmosphere and feel. A teenage boy and a girl in fragile relationship. The world at war. The world around them remains the same while the girl has to fight against the enemy. These works were sometimes referred as “Sekaikei”. Though exact definition of the term “Sekaikei” is under some debate, it is generally agreed that it has two very distinctively different narratives diffused into one; a catastrophic war in progress and a personal struggle of two teenage characters. And there is nothing substantial to bridge between these two narratives. It is this lack of “society” that gave these works unique feel. Or more precisely, it is lack of any form of community – a nation, for example – to substantiate these characters and their motivations as social beings. A character of an over-self-conscious boy speaks of his anguish – in search of raison d’être – to the world (sekai) throughout the story. Shinji in NGE is the prototype of this family of characters, as the last two episodes of NGE became the defining moment for the pop culture of the post-bubble economy. Now, how come these stories lack “society”? Maybe, I could have written the background about the world situation, but I decided not to describe anything the protagonist cannot hear or see. That’s why there is no scene of actual combat. Since scenes of actual combat would reveal how the reality is, I decided not to write it. For example, I myself experienced Hanshin-Awaji Earthquake and Aum Sarin Terrorist attack, when I was 13. The big city collapsed and Tokyo went into the state of emergency as if the war started. But time passed as usual on that day, on the following days. I went to school as usual and I watched the popular variety show on TV as usual. Shinji of NGE experience the similar disjoint between his role as a hero to combat against Angels and as a teenage boy who goes to school everyday. To Shinji, his mission, or destiny even, as a savior of the world is less pressing than his relationship with his father. But I wonder, is a boy really incapable of hearing or seeing the “world situation”? Is it you who decided not to contemplate on the issues of terrorist attacks or the consequences of the natural disaster? Or is it the “society” which demanded you not to dwell on the issues not directly connected to you? Isn’t it true that the society – parents, schools, communities or TV even – somehow made you believe that anything related you and your future is the most important? It is deprivation of imagination.